Jamshedpur/Ranchi: Soon after the death of 70 infants in a tertiary care hospital in Gorakhpur, Uttar Pradesh (UP), made the headlines last month, similar stories began to pour in from across the country. 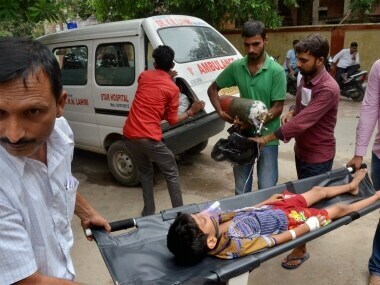 Ninety children were reported to have died in two months in Rajasthan’s Banswara district hospital; in the month of August alone, 55 children had died in Maharashtra’s Nashik Civil Hospital and 49 in UP’s Farrukhabad District Hospital. Tragic as these deaths were, they were hardly unusual, IndiaSpend found on visiting half a dozen primary, secondary and tertiary healthcare centres in Jharkhand, another state that reported numerous infant deaths. Doctors told IndiaSpend that such seemingly high child death figures were routine for the months of July and August, when infections peak and already overburdened hospitals are unable to cope. From our on-the-ground reporting, the picture that emerges is one of a failing healthcare system that stacks the odds against a child’s survival even before she is conceived. Poorly-fed young women are married off too early, remain underweight when pregnant and get little prenatal care and nutrition. Babies are born underweight (less than 2.5 kilograms) and live in conditions where they are exposed to high risk of infection, getting inadequate nutrition that limits their ability to develop the strength to fight disease. Government-run community and primary health centres are dysfunctional, while tertiary care institutes, both private and government-run, are overburdened and mismanaged. Our investigation shows that efforts to reduce child mortality must start way before a visit to the doctor, and public policy must focus on improving primary health care. Carved out from Bihar in 2000, Jharkhand made rapid economic progress from 2005-06 to 2015-16, raising its per capita net domestic income by 36.7 percent. During this period, women’s literacy improved from 37.1 percent to 59 percent, the proportion of institutional deliveries increased from 18.3 percent to 61.9 percent, infant mortality rate fell from 69 deaths per 1,000 live births to 44, and under-five mortality fell from 93 per 1,000 to 54, data from the fourth National Family Health Survey (NFHS-4) show. In collaboration with UNICEF, the state launched the Jharkhand Nutrition Mission in 2015 with the aim of eradicating malnutrition by 2025. Part of the plan was to track health indicators during the first 1,000 days of a child’s life. Yet, 45.3 percent of Jharkhand’s under-five children were stunted, 47.8 percent underweight and 29 percent wasted in 2015-16, while 40.3 percent of its population continued to live under the poverty line (set at Rs 356 per capita a month in villages and Rs 538 per capita in cities). 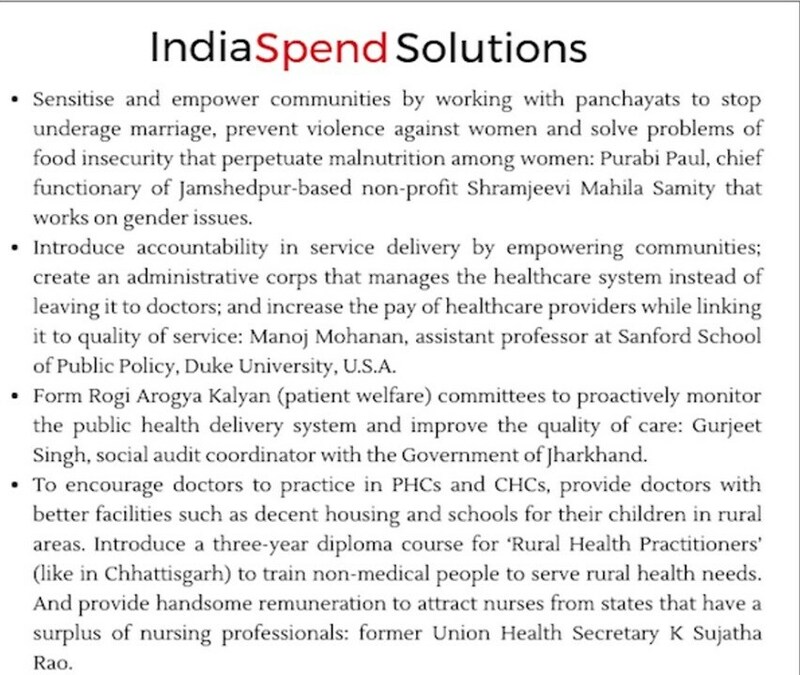 At the same time, IndiaSpend found, Jharkhand failed to utilise the funds allocated for health – only 40 percent of its approved budget for National Rural Health Mission in 2014-15 was spent, down from 61 percent in 2013-14, and there continues to be much mismanagement and lack of oversight all along the value chain. In its failure to translate economic growth into all-round prosperity, Jharkhand holds a mirror to much of India. For five decades, the Mahatma Gandhi Memorial (MGM) Medical College in Jamshedpur has served as the tertiary care referral centre for four Jharkhand districts as well as the bordering districts of West Bengal and Odisha. In the month of July 2017, it recorded 52 deaths – 40 infants in the neonatal intensive care unit (NICU) and 12 in the paediatric intensive care unit (PICU). “Had the babies died in the districts they were born in, our numbers would not be high. 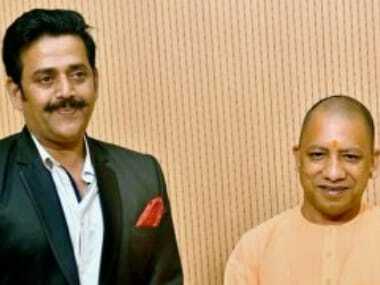 Being a government hospital, we have to admit everyone,” B Bhushan, the medical superintendent of the college, told IndiaSpend. B Bhushan, medical superintendent, MGM Medical College, Jamshedpur. The combination of heat and humidity increase the incidence of infections ranging from malaria, dengue and encephalitis to viral and influenza across India during the months of July and August. Experts ask why hospitals such as MGM were not better prepared. “As in other medical emergencies, more doctors and more beds could have been dedicated to treating children during the months of July and August,” Suranjeen Pallipamula, senior programme officer at international health non-profit Jhpiego, told IndiaSpend. Doctors said they frequently handle low birth weight babies (weighing less than 2.5 kilograms at birth) who are usually born to underweight mothers. When these babies are rushed to overstretched and poorly managed tertiary hospitals – often at critical stages – they rarely survive. Yet, the news of 52 infant deaths in one month had not reduced the number of patients arriving for treatment when IndiaSpend visited the hospital in early September. Everywhere, there were more patients than could be accommodated – about a hundred people were queued up in the central registration wing to consult a doctor in the out-patient unit; in the maternity wing, some mothers with newborns were sleeping outside in the corridor because there were not enough beds; in the NICU (for babies younger than 28 days), there were three infants on one bed. A foul stench pervaded the labour ward which had soiled walls, torn mattresses, leaking bathrooms and filthy toilets. Patients said they had to bring their own bed sheets and buy many medicines with their own money from the market. The postnatal room in the obstetrics department at the MGM Medical College, Jamshedpur. 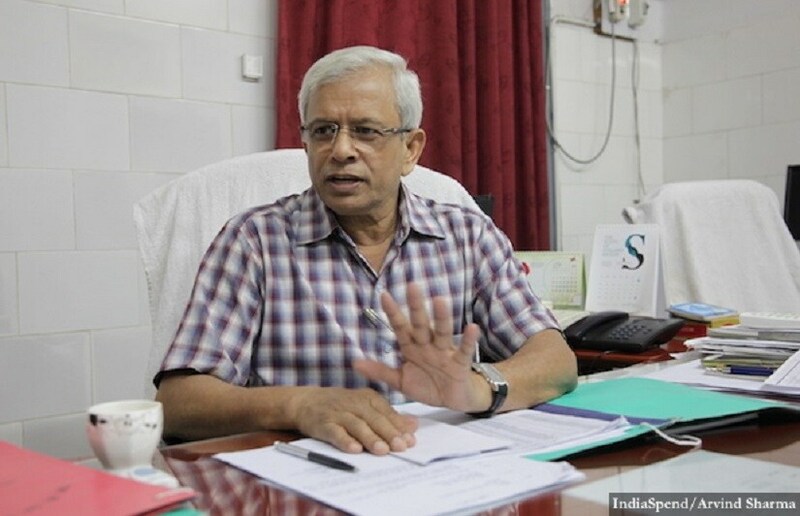 The paediatrics unit needed 11 full-time doctors, Bhushan said, but had managed with five since 2010 when two professors had retired, one had died and another was transferred. “There has been no effort to find their replacement, no advertisements have been placed,” one doctor told IndiaSpend, not wishing to be named. Over a decade after the six-bed NICU was set up in 2005, enough nurses and doctors have not been appointed. The NICU often admits 22 to 24 babies—up to three to a bed. “Most doctors are working extremely hard to save lives, but we are over-worked,” the doctor said. 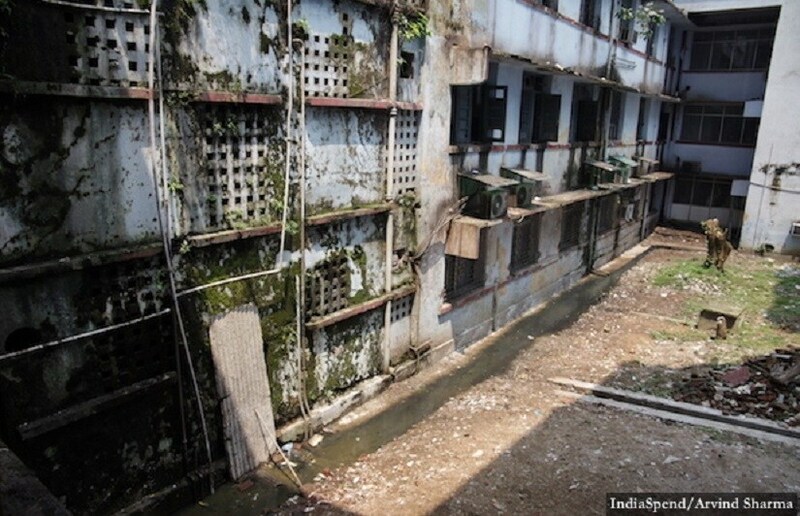 “It is not possible to keep the hospital premises clean with this crowd,” Bhushan said, adding, “There is no lack of funds in the hospital, just shortage of staff across departments.” As a government-run hospital, it cannot fill vacancies on its own and must rely on the state government to do so. The building which houses the paediatric and labour wards at the MGM Medical College, Jamshedpur. The hospital receives water twice a day, when the overhead tank is filled, but often there is no water to sterilise equipment and even wash hands. The situation was similar at the Rajendra Institute of Medical Sciences (RIMS) in Ranchi, where 660 children’s deaths were reported this year. The hospital’s superintendent was sacked when the news broke; his replacement, Vivek Kashyap, denied medical negligence. “It is important to know how many patients were admitted to the hospital when we talk about the deaths,” he said, making the point that the deaths were proportionally few. Previously, hospital director BL Sherwal had claimed an 84 percent success rate – 4,195 of the 4,855 children admitted were cured and discharged. The autonomous institute is much larger than MGM Hospital and has a capacity of 1,500 beds and 33 departments spread over a sprawling campus. Yet, it gets more patients than it can handle. “The paediatric unit has 100 beds but we have 143 patients admitted,” a doctor in the paediatrics unit told IndiaSpend. “We need more beds, more doctors.” He said most patients arrive at the hospital long after the golden hour – the first hour after a medical emergency – because they have to travel from far-off rural areas. “If primary health centres and community health centres worked, we wouldn’t see these many patients,” another doctor complained. They did not wish to be named. 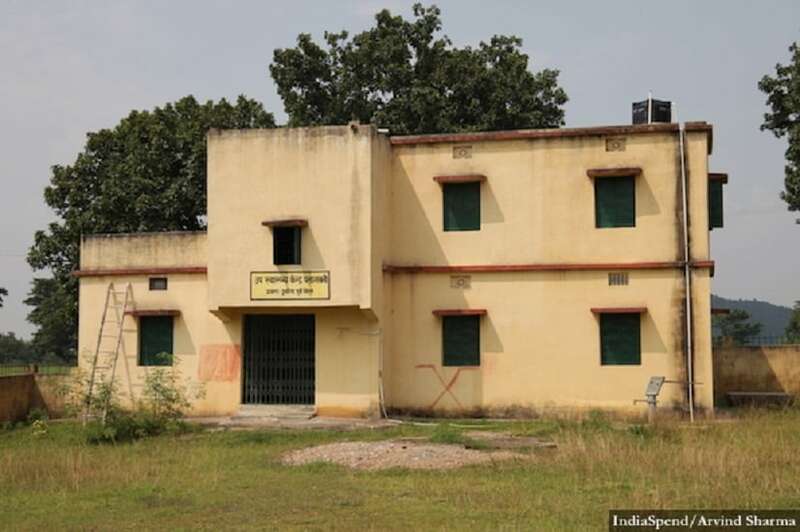 The sub-centre in Palasbani village in East Singhbhum district was locked–as usual, the villagers said. 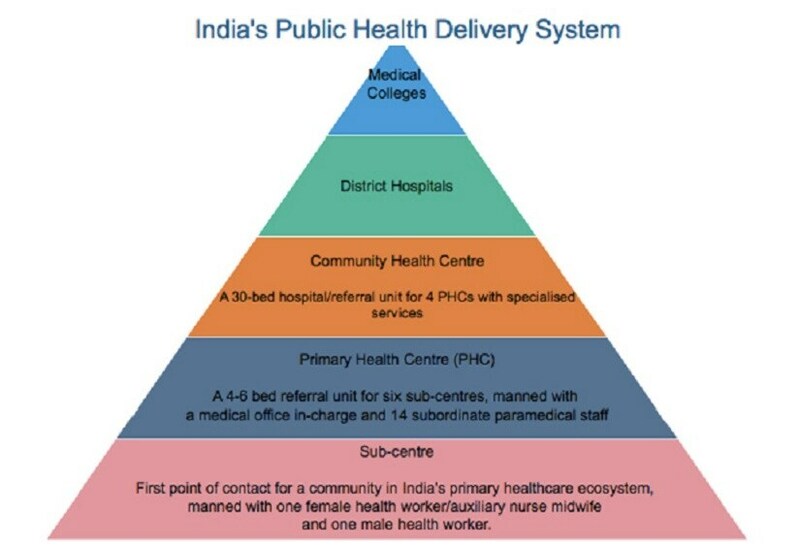 In India’s primary healthcare ecosystem, a sub-centre is the first point of contact for a community and typically caters to 2,500-3,000 people. Government guidelines say each sub-centre should have one Auxiliary Nurse Midwife (ANM) and one health worker, preferably male. A doctor is supposed to visit the sub-centre at least once a month. Although the Palasbani sub-centre is assigned a full-time ANM and an Accredited Social Health Activist (ASHA or community health worker, locally called a sahiya), they visit only once a month, the villagers say. Most members of the 12 hamlets this sub-centre caters to are subsistence farmers and labourers. With the sub-centre nearly non-functional, the villagers travel to the Dumaria Community Health Centre (CHC), Suresh Naik, a local teacher, told IndiaSpend. 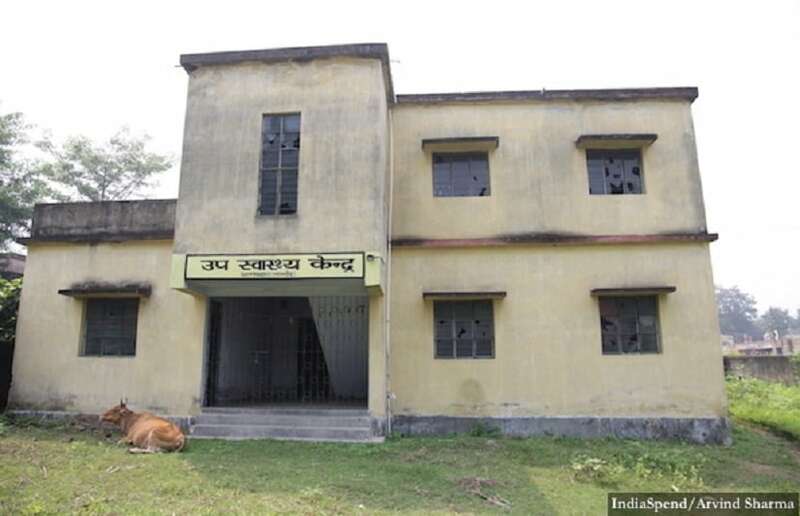 Recalling a 2013 incident in which a pregnant 22-year-old had died – she had had to be taken to the Dumaria CHC and then to MGM Hospital due to complications–Mini Murmu, a young mother, said sahiyas should come at least weekly to check on pregnant women. 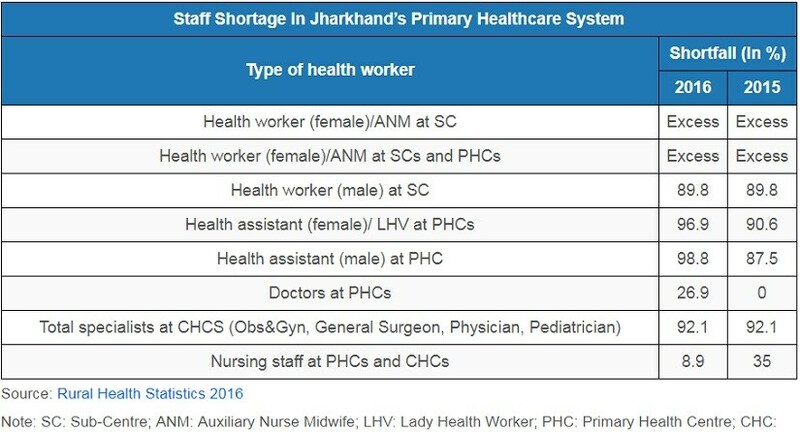 On paper, in 2016, there were surplus ANMs or female health workers in Jharkhand – 7,632 were posted at sub-centres (SCs) and primary health centres (PHCs) as against the 4,280 required, as per rural health statistics. In contrast, East Singhbhum civil surgeon Kala Chand Munda told IndiaSpend, the district needs 141 doctors but has 61. Two-thirds of the 243 sub-centres in the district do not have facilities to deliver babies so that 86 sub-centres with facilities to deliver babies serve a population of 2.3 million – one sub-centre for 26,744 people. 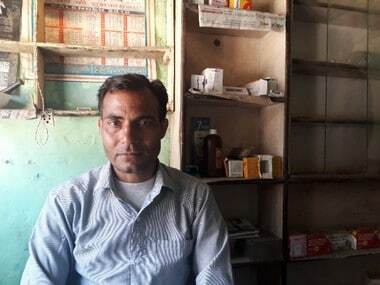 At the PHC in Musabani town in the same district, IndiaSpend found two pharmacists and no doctors, although doctors are supposed to be on duty every day. “Doctors come twice a week,” one of them said, adding that although this PHC has been upgraded to a CHC, it has five doctors against the sanctioned seven posts. “Doctors often need to go for meetings and use the ambulance for transport,” he said. In the newborn unit in the CHC in Kashida town in the same district, three of the 12 warmers are not working. Seven nurses are assigned but there are no doctors in sight. “Doctor comes once a day for a round,” the only nurse present told IndiaSpend. She said they admit three to five patients each day, mostly for fever, jaundice, low birth weight and birth asphyxia. “We do what we can but it is difficult to manage without a full-time doctor and a paediatrician,” she said, adding that they refer patients to MGM Medical College, Jamshedpur, in case of complications. A locked sub-centre at Laldih village, East Singhbhum district, Jharkhand. At the bigger sub-divisional hospital in Ghatshila in the same district which started functioning in July this year, the building is clean and well-ventilated. When IndiaSpendvisited, the outpatient department was working but most other departments were closed. “We have three doctors but only one is permanent, the rest are on contract,” head clerk Saryam Mormu told IndiaSpend. There are four additional doctors but they are posted in other PHCs. Only the labour ward, malnutrition treatment centre and postmortem facility are functional. The newborn unit at Kashida is to be moved here when work is complete, Mormu said. This hospital’s malnutrition treatment centre is one of two in East Singhbhum district that treat children with severe acute malnutrition. The 15-bed centre has seven nurses and two supporting staff. Admitted children are given a nutritious diet and discharged once they gain 15 percent of their body weight. “Most mothers get married early and do not give enough complementary food after six months other than breast milk,” Rinku Mukherjee, a nurse with 10 years of experience, told IndiaSpend. She said poverty and illiteracy give rise to high malnutrition in the region, but the centre ensures compliance with the treatment protocol by giving mothers Rs 100 a day for their own nutrition while the child is admitted and Rs 150 per visit thereafter to encourage them to follow up. Rinku Mukherjee, a nurse with 10 years of experience, weighing a child at the malnutrition treatment centre in Ghatshila sub-divisional hospital, East Singhbhum district, Jharkhand. “Most mothers get married early and do not give enough complementary food after six months other than breast milk,” Mukherjee said. Rinku Mukherjee, a nurse with 10 years of experience, weighing a child at the malnutrition treatment centre in Ghatshila sub divisional hospital, East Singhbhum district, Jharkhand. Jharkhand could do with more such malnutrition treatment centres because women’s poor health lies at the bottom of the state’s poor child health indicators. Take the case of two-month-old Shravani Gop, who died in MGM Hospital on 12 July, 2017. Her 32-year-old mother Sushma Gop lives in the Lal Tal area of Jamshedpur, which lacks electricity, piped water and sewage facilities. The Gop family lives in a single rented room shared with three other families, with whom they also share a hand pump. Sushma’s husband Bablu Gop is a daily-wager and the sole earning member of the family, who brings home about Rs 4,500 per month. His wife from a previous marriage had died of jaundice, leaving behind a daughter, Shalu, who is 10 and bedridden due to a neural-cerebral disorder. Sushma got pregnant soon after she married Bablu last year. 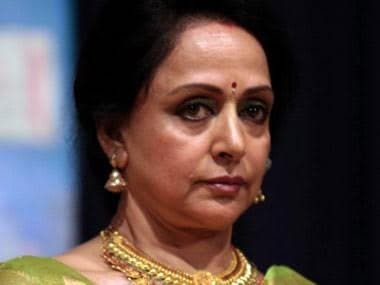 Her pregnancy diet consisted of doodh-roti (milk and unleavened bread) and chawal-saag (rice and vegetables), she said, adding that she often felt dizzy and weak, which are signs of anaemia. She was hospitalised thrice and given blood transfusions. Sushma had a normal delivery in May, but could not express milk, so baby Shravani was fed formula milk. One day, when two months old, Shravani vomited all the milk she had been fed and seemed to have difficulty breathing. The family rushed her to MGM Medical College on 11 July. The next day, they were told Shravani had died. They are not sure what caused the death. The medical records show Shravani weighed 1.8 kilograms at two months (normal weight at birth is above 2.5 kilograms in India), which made her a very low birth weight (VLBW) baby. She was diagnosed with septicaemia, a condition in which infection enters the bloodstream and causes sepsis, a life-threatening condition when chemicals released by the immune system into the bloodstream to fight an infection instead cause inflammation throughout the body. Twenty percent of all deaths in VLBW babies are due to sepsis, and babies with sepsis are three times more likely to die than those without. Sushma’s pregnancy, due to her severe anaemia, should have been flagged as high-risk by the ANM at the sub-centre where Sushma registered herself. Instead, Sushma says, she never saw a doctor at the sub-centre during her entire pregnancy. Sushma Gop with her husband Bablu and step-daughter Shalu at Lal Tal, Jamshedpur. Government guidelines say a pregnant woman must receive at least four antenatal check-ups examining her blood pressure, weight and haemoglobin levels; she is also supposed to receive iron and folic acid supplements. Sushma’s antenatal card was at her mother’s place, so it was difficult to ascertain the amount of antenatal care she received. IndiaSpend checked the antenatal care cards of three other mothers whose children were admitted in the NICUs at MGM Medical College, Jamshedpur, and Rajendra Institute of Medical Sciences, Ranchi. All three women had weighed less than 45 kilograms at six months of pregnancy and were anaemic (with haemoglobin levels lower than 11 gram per decilitre), and their babies had weighed between 1.2 and 1.85 kilograms at birth. These women are not outliers–in 2015-16, 62.6 percent of pregnant women in Jharkhand were anaemic, worse than the high national average of 50.3 percent; and 31.5 percent of women in the state were underweight, compared with a national average of 22.9 percent, according to the latest National Family Health Survey (NFHS-4). In comparison, 23.8 percent of men in Jharkhand were underweight (the national average for men is 20.2 percent), pointing to a widespread disregard for women’s nutrition and health. Malnutrition is a multi-faceted problem without easy fixes. "It is linked with issues of food security, sanitation, education and empowerment of women, with poverty and deep-rooted cultural practices like early marriage and not breastfeeding children," Rajan Sankar, programme director for nutrition at Tata Trusts. Further, 38 percent of women aged 20-24 years had married before the legal age of 18 years, as against the national average of 26.8 percent. 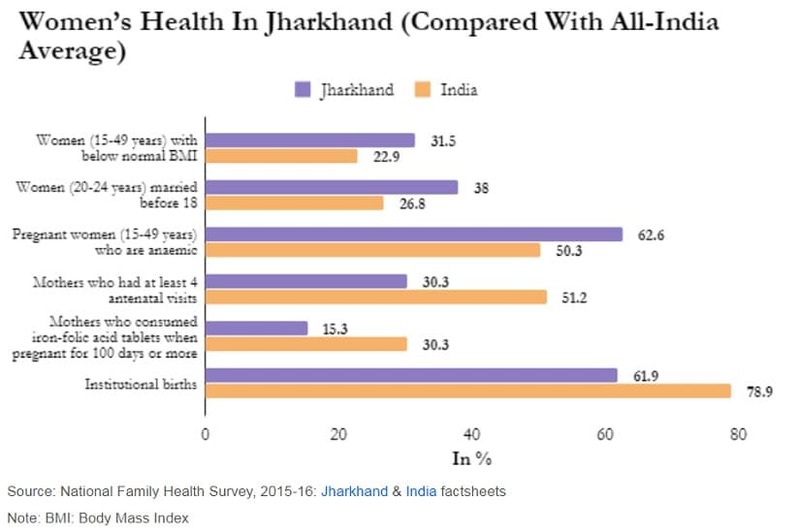 Effectively, four among every 10 women in Jharkhand were married before attaining 18 years of age, three out of 10 were underweight, and six out of 10 mothers were anaemic in 2015-16. Underage, undernourished and anaemic mothers are more likely to give birth prematurely, have complications during delivery and give birth to low-weight babies, all of which increases the risk of death for both mother and child. In addition, these women are less likely to get the minimum four antenatal care visits, consume iron-folic tablets during pregnancy and give institutional births. It is no surprise that Jharkhand has among the worst infant mortality rates in India – 44 per 1,000 live births. 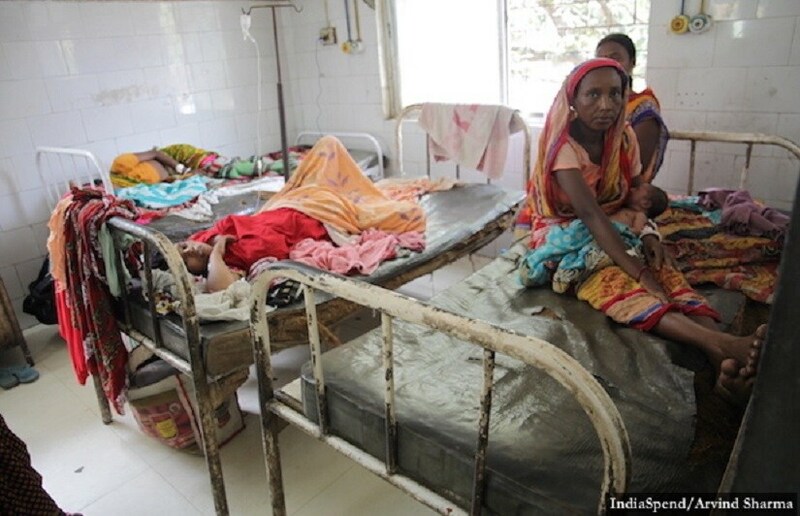 While IndiaSpend found widespread under-capacity in most healthcare facilities it visited in Jharkhand, a budget brief by the non-profit Centre for Policy Research shows the state had not utilised 60 percent of its approved budget for the National Rural Health Mission in 2014-15. In 2013-14, it had not utilised 30 percent of its allocation. The entire state’s health department has been drawing its salary from NHM funds, Gurjeet Singh, social audit coordinator with the Government of Jharkhand, told IndiaSpend. He said funds are released in spurts when big tragedies occur. There is an urgent need to bring back community-led monitoring of primary health care through platforms like Rogi Kalyan Samiti (RKS, or Patient Welfare Committee) introduced under NRHM in 2005, Singh said. Most RKSs in states have not been very active in holding monthly meetings and putting forth their requests, but the few that have ensured better quality care at the community level. 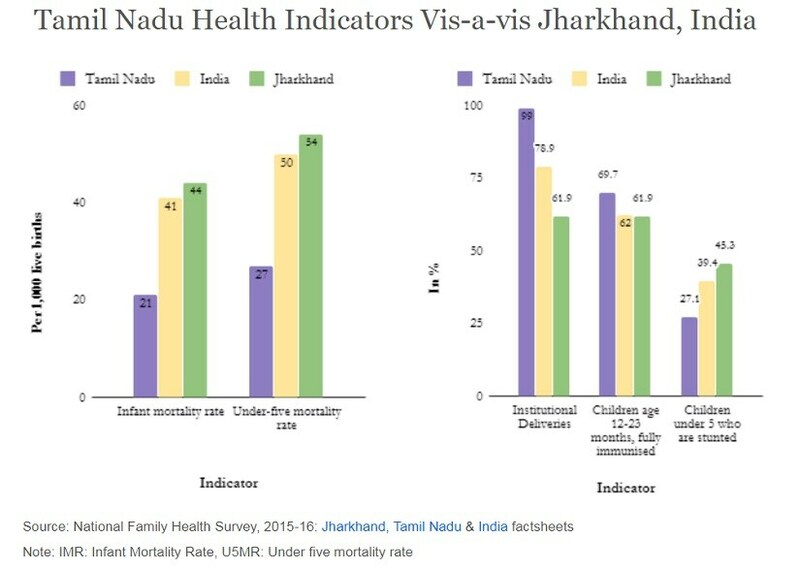 In contrast to Jharkhand, Tamil Nadu has achieved among the best child health indicators in the country, mostly by improving health infrastructure and healthcare management. Since the 1980s, the state has deployed thousands of multipurpose workers as village health nurses to serve population clusters larger than 5,000 people. It has built more health sub-centres and PHCs and has started round-the-clock services to cater to emergency obstetric cases. It has also adopted a universal immunisation programme since 1985. “Tamil Nadu has also been able to concentrate on many of the health ‘basics’ that have been so neglected in much of India,” Amartya Sen and Jean Dreze wrote in their 2013 book India and Its Contradictions. Tamil Nadu is also the first state to develop a public health cadre which separates the role of the doctor and that of the administrator/manager. In addition, a medical services corporation was formed to regulate procurement, distribution and rational use of generic medicines. Further, it enacted a Public Health Act, the only one of its kind in India, that assigns responsibility and sets standards for water quality and food hygiene, and mandates monitoring. 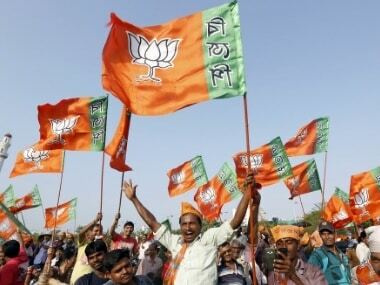 Jharkhand, like all Indian states, could benefit from following the Tamil Nadu model. But for that, health has to be a public policy priority.